"This is an elegant version of the old-fashioned tomato and rice soup, studded with fresh seafood. If you want a simpler dish, omit the seafood. If you are lucky enough to have a garden full of fresh tomatoes, you can substitute them for the canned variety. 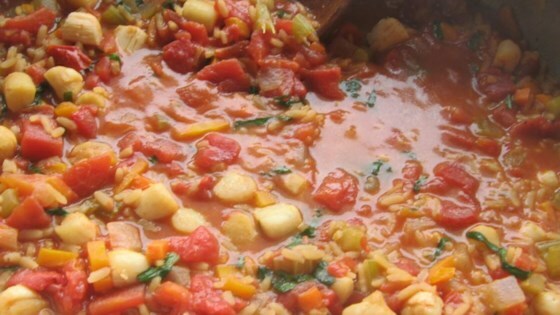 Use about 1 and 1/2 pounds ripe tomatoes, cored and chopped." Heat oil in a large saucepan over medium heat. Add the onion, celery, and carrot; cook and stir vegetables until they begin to soften, approximately 2 to 3 minutes. Add rice and cook, stirring until rice is evenly coated in oil, 1 to 2 minutes. Stir in undrained tomatoes, chicken broth, and salt and pepper. Bring to a boil. Reduce heat, cover, and simmer for 15 minutes. Rinse the scallops, and if large cut scallops in half. Stir the scallops into soup, and cover. Continue to simmer until the rice is tender and the scallops are opaque, approximately 5 to 10 minutes. Season to taste with salt and pepper. Stir in the basil, and serve. I'm not a fan of this recipe. I didn't care for the taste. The soup was more like a stew. It was not what I expected. I doubled the broth. This soup was quick, easy and tasty.